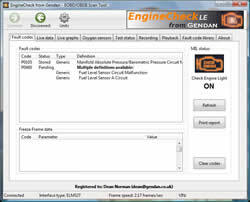 EngineCheck Lite is a cut-down version of our award-winning EngineCheck software. It will allow you to connect to the engine management system on the same range of vehicles and view basic fault code information, but does not offer any of the more advanced features found in the full package, such as live data streams, and the ability to record and playback information. 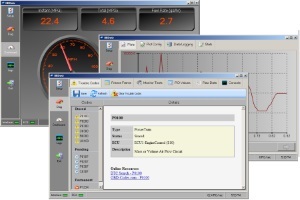 We also currently include the OBDWiz software from Scantool.net, which offers live sensor data in graph and dial formats. "The same/similar product from other suppliers works on all 1996 and newer cars... why doesn't yours?" Please note: EngineCheck software not shipped on CD - download information sent by email. 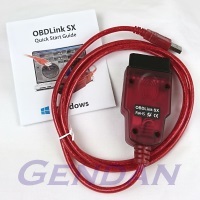 This interface will allow you to connect to your EOBD or OBDII compliant car. These are petrol cars sold within the European Union from 2001 and diesel cars sold from 2004.
great product works brilliantly on my car worth buying for any tools box.